Luckily I do not get this comment as much as I used to, but for a good few years students who had me as a computer animation instructor were easily surprised to learn I knew how to draw. It’s a very common misconception that students entering a computer art degree feel the technique of drawing is unneeded. This is incredibly not the case! Drawing is the foundation of any arts program, including 3D. The basic core thought of if you cannot visualize an object traditionally in three dimensions how will you create that object with 3D software? Once students start researching and looking at job postings at the ‘dream’ locations, every post will reiterate that drawing skills are needed. The basis of a computer software can be learned and perfected, but the core foundations of understanding volume and form is needed. Since then we have added more drawing components into the 3D classes to reiterate the foundation skill and translate it into the 3D medium. Consider story boarding, blocking out poses, creating textures, etc. Here is a throw back to a drawing I did in college. This was our figure model, the assignment near the final if not the final project. I honestly cannot remember. It might have been one of the Up-All-Night sessions. Anyway, it was a long 3 -4 hour pose. The goal was to capture the model and put into a setting. 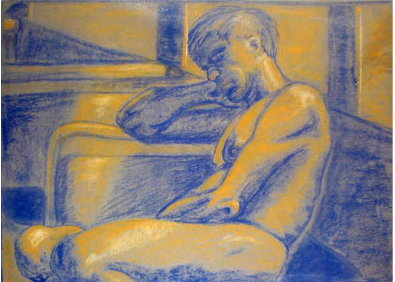 When I positioned myself and easel in the room, the slope of his position reminded me of resting after a long day of work. Why not on the bus? The second figure is from the time at my Masters degree. Here we focused on contour line and building form. 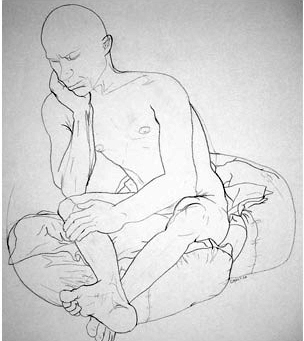 No shading present, just line work to define the volume of the figure.